Ahead of his upcoming IBF Heavyweight Title Eliminator, against Tyson Fury, at Madison Square Gardens this coming Saturday, the 20th April, former two time Cruiserweight Champion of the World Steve ‘USS’ Cunningham took a little time off from his final preparations, to send a message of support across the Atlantic to former ‘Team Cunningham’ boxer Marianne Marston, who will be fighting Latvian Aleksandra Jasjukevica at York Hall in London one week later on Saturday 27th April. Even though it is just a few days away from what many perceive to be the hardest fight of his career, Cunningham, who was oncedescribed by Bad Left Hook Magazine’s Scott Christ as ‘The World’s Nicest Man’, once again proved just what a genuinely nice guy he is, by contacting his former charge, British Featherweight Marianne Marston, and wishing her every success for her upcoming fight. 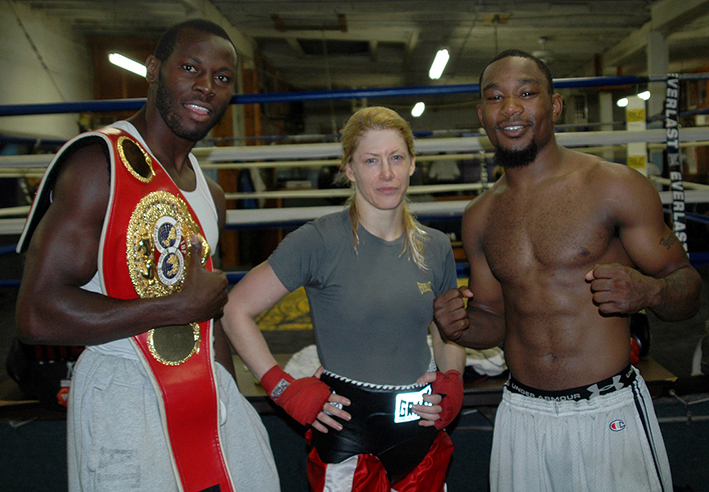 Marston, who now resides back in London and is trained by Barry Smith at the TRAD TKO Boxing Gym in Canning Town, was invited to become part of Team Cunningham following her move to The James Shuler Memorial Gym in West Philadelphia, after her original ‘home’ gym, Smokin’ Joe Frazier’s Gym in North Philadelphia, closed in March 2008. Under Cunningham’s tutelage Marston was set to debut in South Philadelphia in May 2009, however following her return to the UK in February of that year, to arrange her P1 Professional Athlete visa, things went sour for the ‘Golden Girl’ after the US Embassy refused her the visa, even though there had been no problemswith her living in America, whilst training and preparing for her planned professional debut. Following his call of support, Cunningham briefly said of his former charge. "It's great to see Marianne finally getting her pro debut, she has been training hard for years and this is a long time coming!" Before adding, “I know she will be victorious, I only wish I could attend to cheer her on in person." Just one week later, on the 27th April 2013, Marianne Marston versus Aleksandra Jasjukevica features on the undercard of Dean ‘Irish Lightning’ Byrne - Jay ‘IOW Assassin’ MorrisInternational Masters Welterweight Championship clash which headlines Dave Murphy’s Thunderdrome Promotions ‘Thunder & Lightning’ event at York Hall, Bethnal Green in London.